Melon Margarita served in a Margarita glass with a piece of melon and sugar or salt rim, the common way of presenting that fruity tequila cocktail. 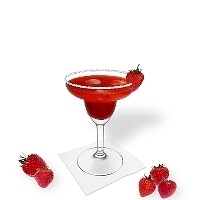 Martini glasses with their long and fine bezel are ideal for sugar or salt rims. 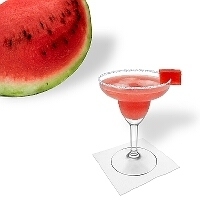 Another great option for Melon Margarita, a cocktail saucer. 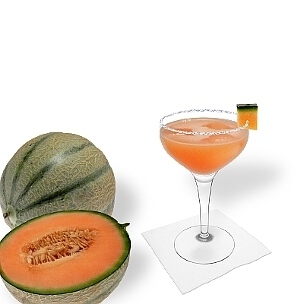 Melon Margarita is a fruity, light and palatable tequila cocktail. The green-yellowish or orange color from the melon (depends on the type) and it's fuity taste characterize that delicious Margarita variation. Unfortunately preparation takes a bit more time than for normal mixtures, because you have to do both, blending and shaking. 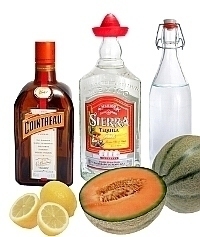 Tequila is refined with triple sec, lemon juice and fresh melon mash (or liqueur, syrup). It results an extraordinary cocktail with a fine note of tequila and intensive melon flavor. A good looking cocktail cocktail for many occasions, like e.g. parties or nice get-togethers. Measuring unit cl, gfl. oz., oz. Which one is the best recipe variation? 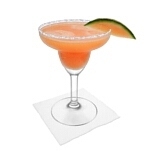 A crusta looks really great and complements Melon Margarita perfectly. 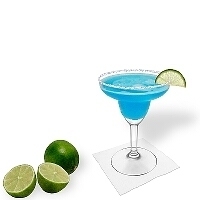 With a sugar or salt rim it's best practice to start preparing the glasses before you actually begin mixing the drink. We recommend a piece of melon for decoration. So, cut off a chunk of melon, make a vertical cut in the middle and place it on the glass rim. Next, cut down and seed the melon. Place the melon cubes in a blender and mix it for about 20 seconds on maximum power (until it's well splashed). Next, pour the melon mash into a cocktail shaker. 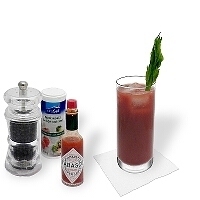 Add all other ingredients along with 2-3 ice cubes and shake it hard. 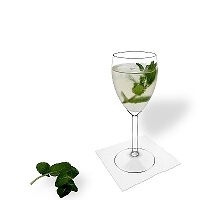 Finally, strain the mixture into the decorated glass with 3 ice cubes and serve it ice cold. 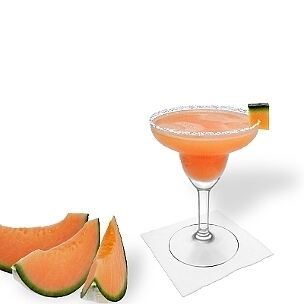 Sugar or salt rim, what is your favorite for Melon Margarita? Do you like salt rims? Do you like sugar rims? Our survey shows that there are some people out there preferring a salt rim and for most of those a sugar rim is not a problem. 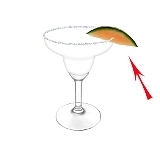 On the other hand, most of those favoring a sugar crusta don´t like Melon Margarita with a salt rim. Either way, try it out or play safe and serve it with a sugar rim. It's an American habit to make the crusta only on one half of the rim. Like that you could prepare one half with sugar and the other with salt. Usually with this technique, you leave one half empty that it's possible to drink it without crusta. In our opinion an entire custa looks better, tastes better and sticks better to the glass. 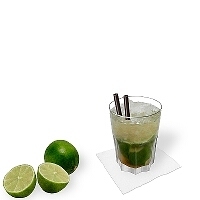 A straw can help for those with an aversion against crustas. Use a low or mid priced tequila. Expensive bottles should be drunken pure. Dose the lemon juice and the sweetness very carefully. Mix with fresh lemon or lime juice, no concentrate. 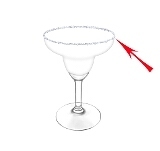 Indeed wine glasses look great, but the edge is a bit too short for a long lasting sugar or salt rim. 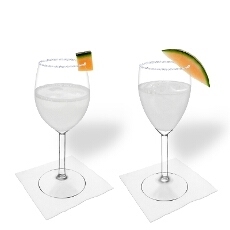 Margarita, Martini or cocktail glasses are most appropiate for Melon Margarita. Present it with crusta and a slice of melon. 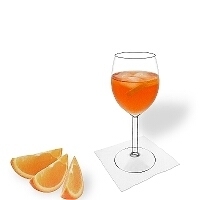 A good presentation and an adequate environment are as important as the taste of cocktails. 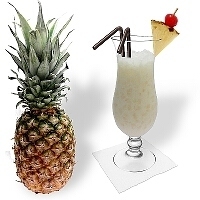 Use our decoration tool to test different decorations and glasses. Try out different decorations and glasses with our decoration-tool. Choose the desired options on the right side and your picture will be displayed immediately. Decorations and glasses which we recommend are labeled, but also all "not common" options are available. You can save created pictures for the pdf-download or your menucard. 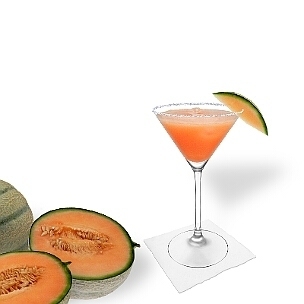 What's the best serving suggestion for Melon Margarita? 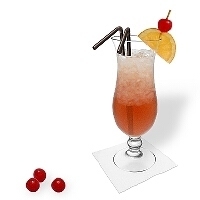 Help others by sharing your experience and rate this drink. Just click on the corresponding star. Be the first person to write a comment for this drink. Please help others with your experiences and write a comment. We will check you comment before publishing it and reserve the right to delete inappropriate comments. Enter your comment here please..